With the new Find A Dealer Map, you can visually see where the dealers are on every page. Click the Find A Dealer Map icon and you will be taken to a full-size interactive version of this map. 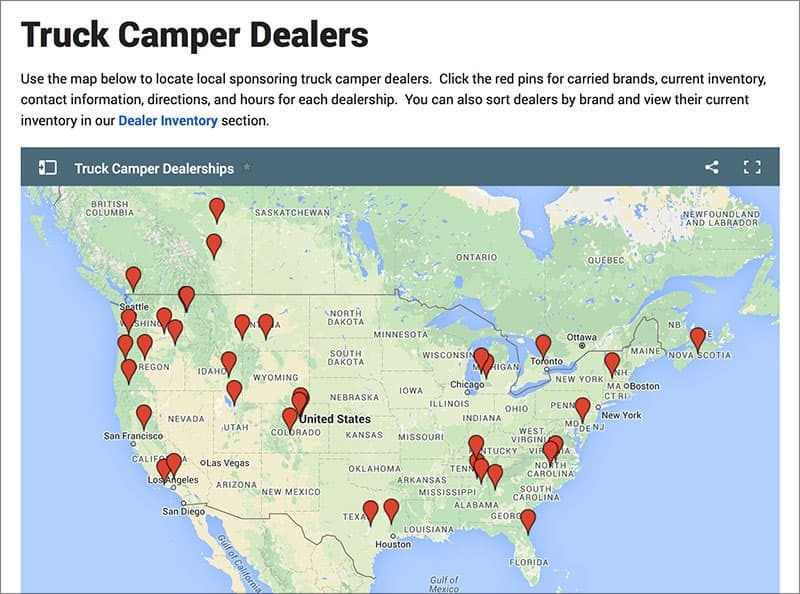 On the map, dealers are presented by red pins making finding your local truck camper dealer fast and intuitive. Click on a red pin for a dealer’s contact information, lines carried, and a link to their Dealer Inventory page. 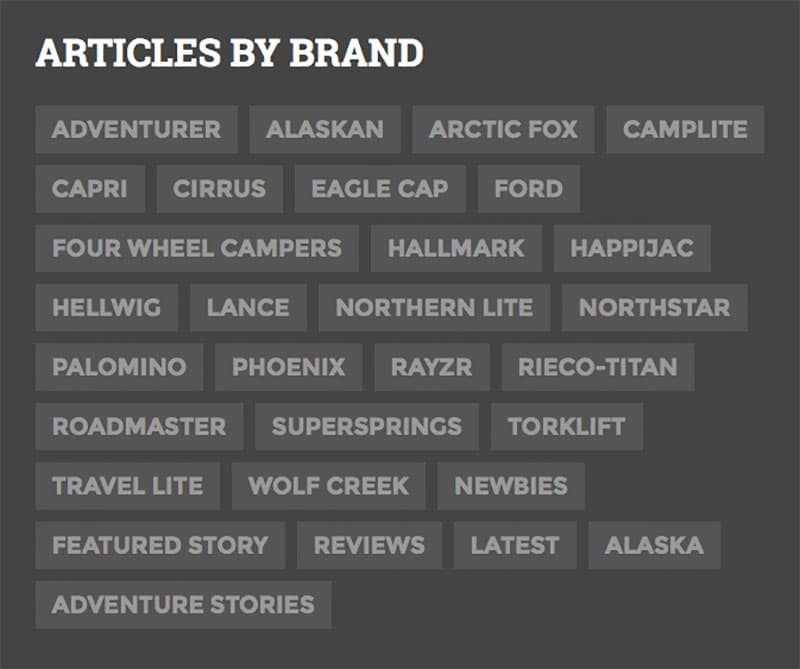 At the bottom of the website there’s a new area called Articles By Brand. In this area you will find every truck camper brand and truck camper gear company listed in a series of tiles. Click one of these brand tiles and you’ll be taken to a page listing every announcement, news article, review, and truck camping adventure story featuring that manufacturer. Along with the significantly improved search feature, Articles By Brand will make finding content faster and easier than ever before. There are more new features, but we’ll let you discover them on your own. Consider this a virtual Easter Egg hunt, without the awkward bunny suit. Happy hunting! Find A Glitch? Please Tell Us! We have carefully tested every facet of the new website, but we may not have tested it on your exact device, operating system, and web browser. If you see a problem on your computer, tablet, or smartphone, please click on the link below, and report it immediately. The new Truck Camper Magazine is full of new ways to rediscover and explore the 2,000+ published articles and blogs contained here-in. In fact, we were repeatedly distracted by our own content during the construction of the website. There are so many great stories from amazing truck camper enthusiasts all over the United States, Canada, and the world. They’re waiting to inspire you. Thank you for reading Truck Camper Magazine!